View of the Church and Gateway of St Alban's Abbey, Herts. bl.uk > Online Gallery Home	> Online exhibitions	> Topographical drawings	> View of the Church and Gateway of St Alban's Abbey, Herts. View of St. Albans Abbey and gatehouse seen from the river Ver. Although the site has been a place of pilgrimage for over 1,700 years, the present building was originally constructed in the 11th century. It has been re-built and refurbished at various times in its history, most significantly in the 12th and 19th century. It is vast, possessing an extremely long, Romanesque-style nave. 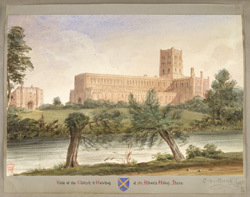 This is a copy by Charles Alban Buckler of a watercolour given to him for his 21st birthday in 1845 by his grandfather, the artist and architect John Buckler (1770-1851).